OK, now I feel old. Vintage Velcro. ohh. . . I have a thing for vintage sewing notions. This might be my favorite so far! 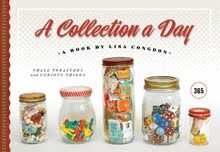 the whole concept for this site is just genius...makes me wish I had come up with it myself! sewing notion sounds much better than- kit. so much detail-a ship at full mast! at first glance thought they were matchboxes or postcards. I am always drawn to old sewing notions - brings back so many memories of sewing class in junior high. Love your blog! My grandmother's sewing notions had same things! 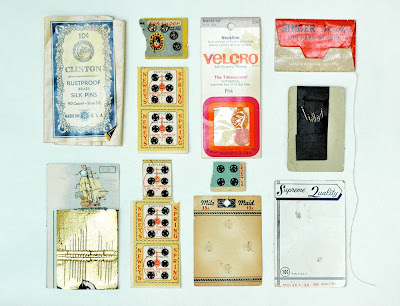 Partial cards of fasteners; snaps, hooks/eyes and buttons! Various packages for needles. Makes me want to look at them again. Just found this site. Very nice. Will take a while to 'catch up' since today is day 98. Thank you for sharing.